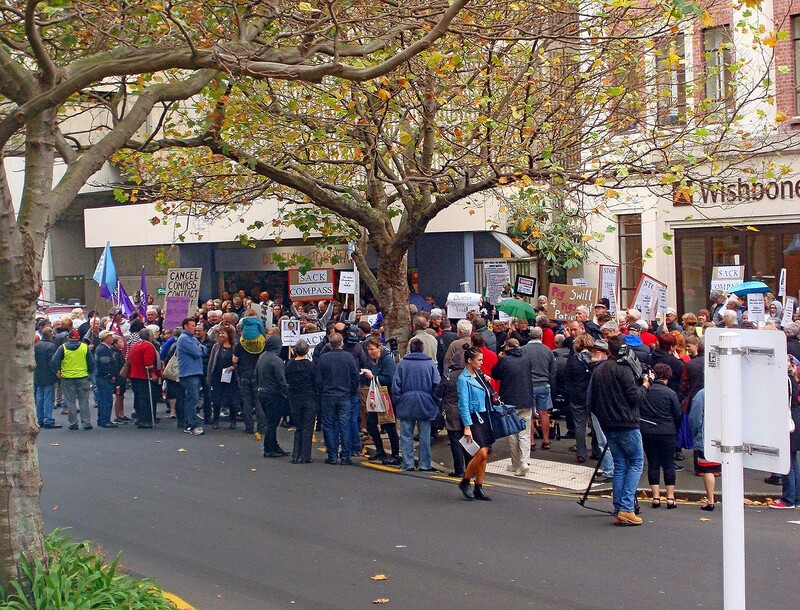 I recently attended the protest regarding the standard of food on a wet Friday afternoon outside of the Dunedin Hospital. I went because a lady from my Community Board area has been seriously ill in hospital and her family have been bringing in meals from home to help build up her strength. Her grandson plays rugby with my son so I’ve been hearing from the family about how her treatment and care has been going on the sidelines lately. To my surprise I saw her in a wheelchair wrapped in a blanket with her family at the protest. I couldn’t help but admire her for taking a stand despite the fact that she has been so dreadfully ill. In an earlier post I wrote (The Community Compass) that one of the issues with the food problems at the hospital is that local people feel they have lost control of the decision-making process. There is a strong view in the community that the hospital is owned by the community for the community. However, In light of the removal of the SDHB Board by the current government this has become even more pronounced. One of the biggest disappointments at Fridays protest was the absence of local City Councillors. This was not lost on the crowd who attended, especially when the Mayor of Invercargill, Tim Shadbolt spoke. While its true that the City Council has no control over the management of healthcare in Dunedin, hospital services impact on the well-being of the city on social, economic and community levels. These impacts are also part of the governance and leadership role of the Council in its management of the city. Take for example the impact of employment in the city through the hospital and the flow on effects of that employment on our local economy. The importance of the hospital as a teaching facility for the Medical School is another area important to the city’s economy and its prestige as an educational leader both nationally and internationally. Finally, there is the desirability of Dunedin as a place to live, work and to do business in because we have quality healthcare facilities available. All of these factors impact on the Council’s ability to manage, promote and develop Dunedin at a range of levels. Its time that the Council understood that and acted. In my opinion, the food issue is a symptom of a much greater problem in healthcare, especially in the way that services are provided in regional centres like Dunedin. Healthcare services transcend political affiliations. All of us at some time in our lives will have whanau, friends and neighbours who will need treatment and care. This returns us back to the fact that this is an issue of how local people have lost the ability to manage the services they require in their own community. This entry was posted in Broad Bay, Dunedin, Local Issues, Macandrew Bay, Otago Peninsula, Paul Pope, Portobello, Tomahawk and tagged Compass, Dunedin City Council, Dunedin Hospital, Hospital Food, Paul on the Peninsula, Paul Pope, SDHB, Southern District Health Board, Stop the Slop on May 2, 2016 by Paul on the Peninsula.